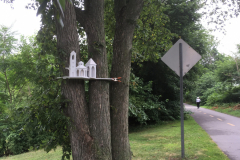 Arlington Public Art commissioned Christopher Frost to create a site-specific sculpture for PATHWAYS: Contemporary Art on the Minuteman Bikeway. 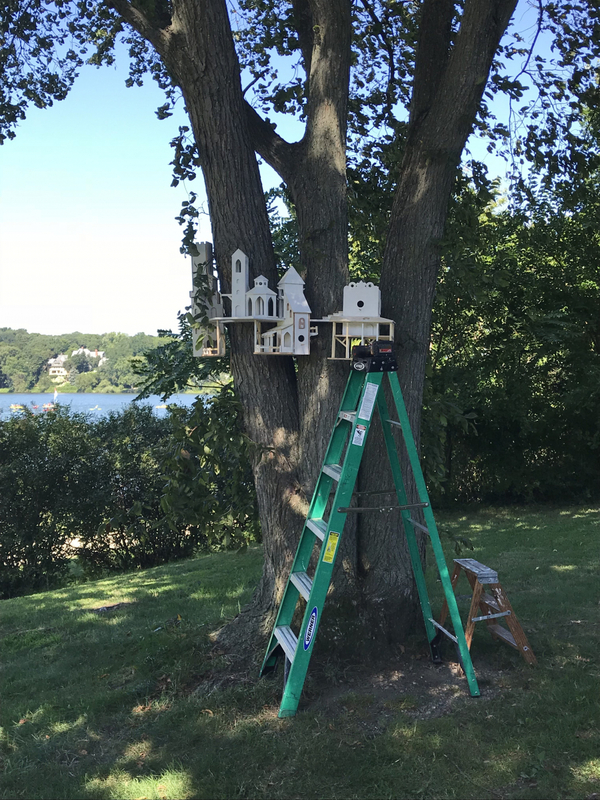 We asked Chris to think about our 2018 theme of birds and nature; we also encouraged him to bring his strong interests in architecture and play to conceptualizing a new work for Arlington. 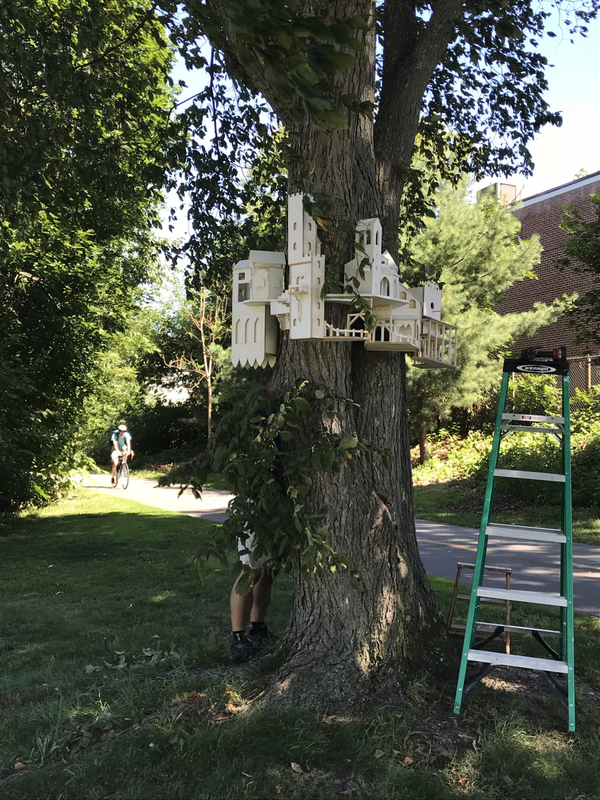 The result is Colony, a whimsical architectural folly constructed at bird scale perched on a mature tree overlooking Spy Pond. 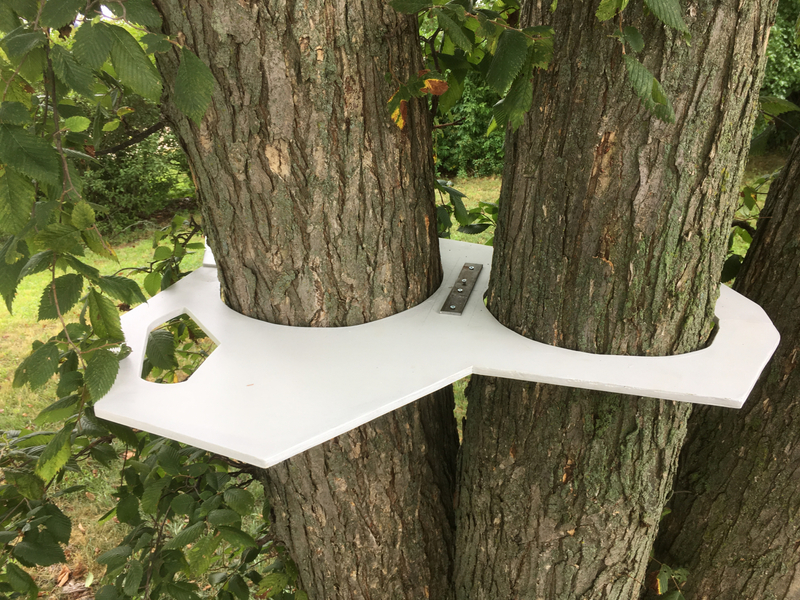 Chris built the sculpture using platforms that fit around the trunk like a collar; the tree’s health was protected by this design because no nails or screws were used. 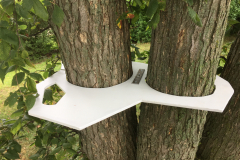 When my daughter and I began conceiving the public art piece that became Colony, we thought to involve local fauna. 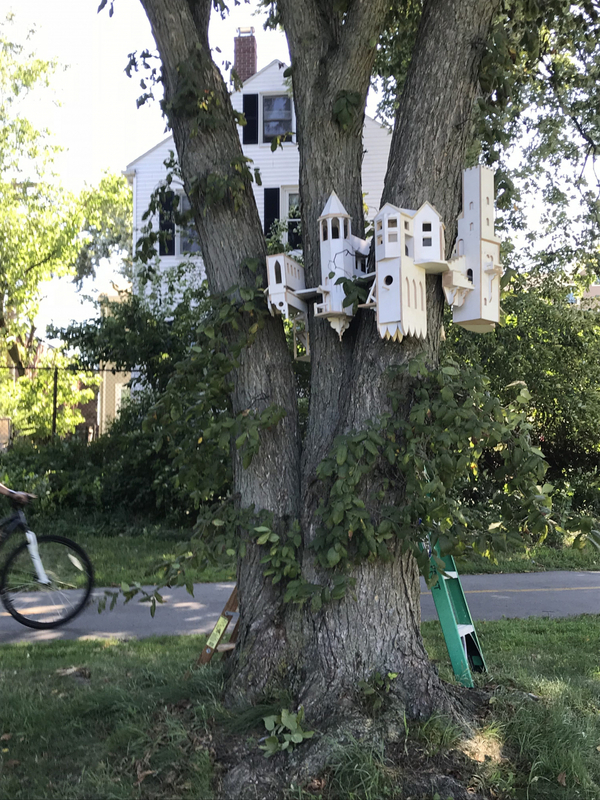 We began with the idea of funky architectural houses for birds in numerous trees along the Bikeway. 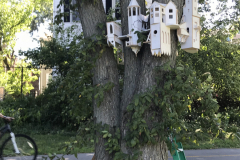 Then: “What about two houses in one tree? Why not 3 or 4?” And then…well, obviously, it got out of hand! 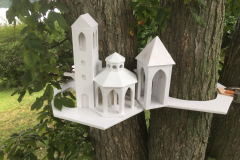 The sculpture became a village, a cluster of domiciles, walkways, and ladders in the sky. Some of the buildings reflect familiar architectural styles: gothic, medieval, mission, classic New England. But most are simply fantasy. We scouted various trees and locations, but we loved this tree with its three trunks and absolutely beautiful view! 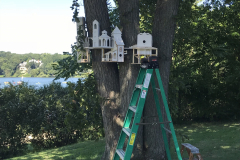 We hope some birds will move in. 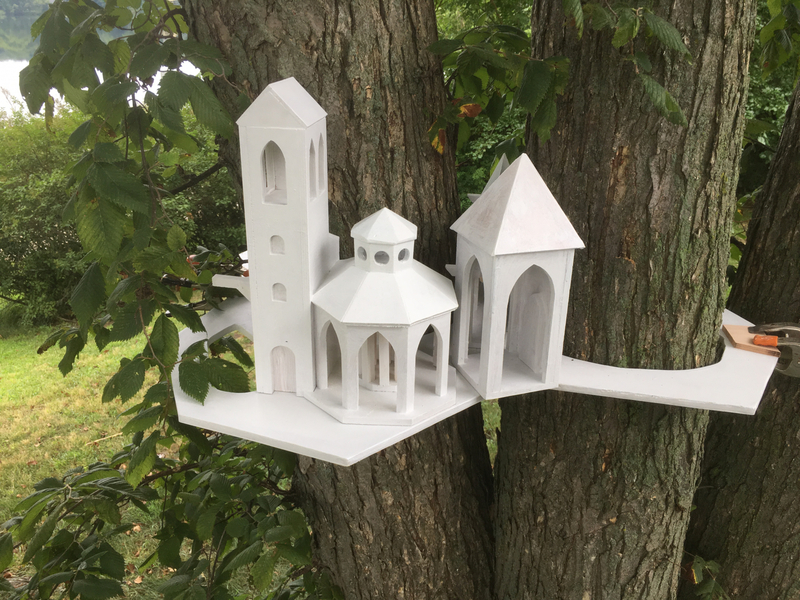 They’ll be able to visit with neighbors and hang on the porches, watching the humans walking, jogging and biking by. 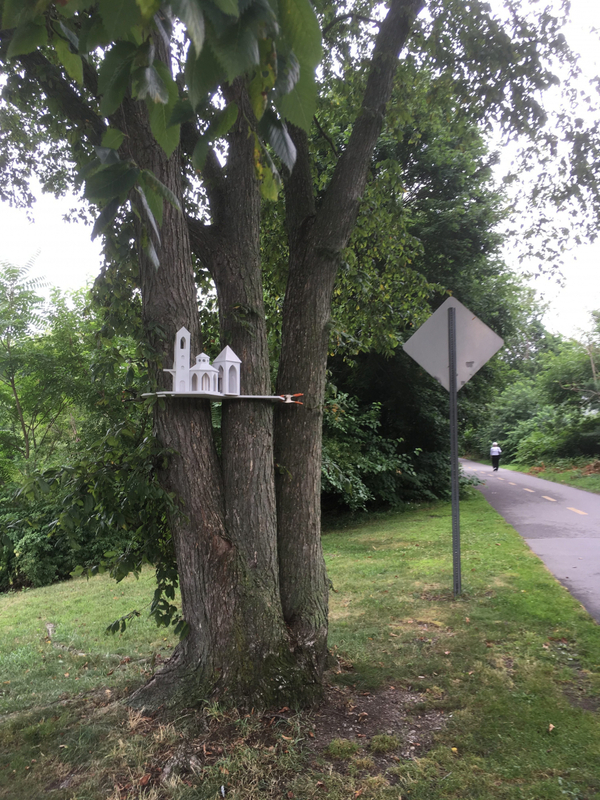 Neighbors of Colony have been contributing to the sculpture, placing little figures on porches and walkways. We enjoy these additions and love the interaction between the artwork and visitors. To keep the piece fresh and ever changing we may remove items as they age and allow for new figures to arrive. Chris Frost lives and works just over the border in Somerville. His daughter, Basil, is studying architecture at college. They both really dig birds! 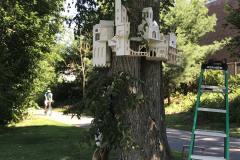 PATHWAYS is supported by grants from the Arlington Cultural Council, a local agency, the Massachusetts Cultural Council, a state agency, and the National Park Service. Additional support generously provided by donations from individual supporters of the arts and the Town of Arlington.